Talk N Text now offers upgrade to LTE SIM to all their subscribers without any charges. As part of their campaign to enjoy better and faster internet connection speed, you can bring your old active non-LTE SIM to your nearest Smart store and request for replacement for free. The good thing is that you can still use the same or current number after availing the new LTE SIM card. 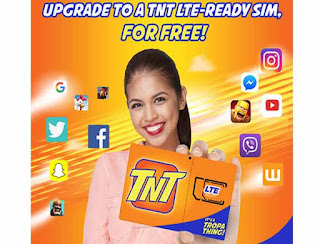 If you don’t have no existing or non-active TNT SIM card, you can still buy Talk N Text LTE SIM card for only 30 pesos that comes with free unlimited text to all and 7-days Facebook access. This service is exclusively open to all TNT subscribers nationwide by visiting Smart store. You need to surrender your old SIM card so make sure to bring it if you’re planning to request for replacement. Please see tips and guidelines below as your reference. It’s a tri-cut SIM so you don’t need to worry about fitting the SIM on your mobile phone. It also works even if your area is not yet covered by LTE and you can still register to any Talk N Text Promos like Surfmax even if your phone is yet LTE ready. If you happen to try this free upgrade service, tell us experience by hitting the comment box below. About the Unlimited sms... does it have any limitations? How to activate unli sms for 2days? can i upgrade my tnt sim to lte,even if my tnt sim is a retailer one?